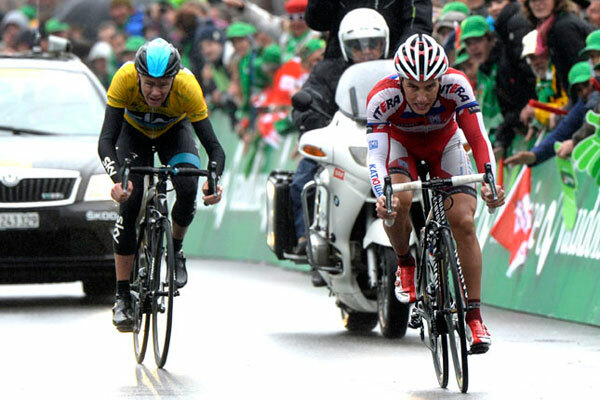 Katusha’s Simon Spilak beat Chris Froome (Sky) in a two-man sprint to win stage four’s rainy queen stage of the Tour de Romandie. The Slovenian’s win was his second of the season, and also saw him move into second in the overall classification, 47 seconds behind Froome, who looks sure to consolidate his victory in tomorrow’s time trial. The peloton contested a queen stage the route of which was significantly altered. 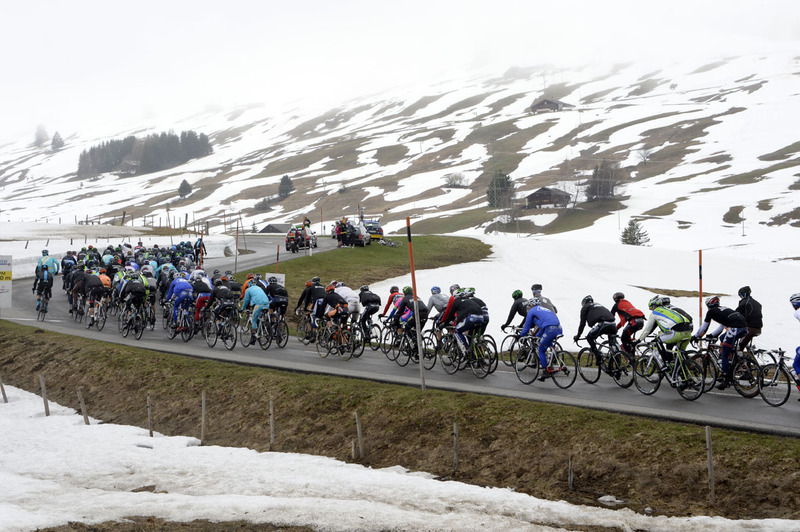 Snowfall meant that the second accent and descent of the Col de la Croix had to be cancelled, as the riders were instead sent on an uphill but easier ride to the finish in Las Diablerets. On the run-in team Sky were put under pressure from threatening attacks by Tony Martin and later Thibaut Pinot, Robert Kiserlovski, Marcel Wyss and Simon Spilak. When their last man Richie Porte could put no more in, Froome moved to the front and dropped the rest of the group, joining Spilak who remained up the road. The pair gradually extended their league, and finished one minute and three seconds ahead of the chasing group. The Movistar duo of Rui Costa and Alejandro Valverde sprinted to third and fourth respectively in the chasing group (which did not include a dropped Andrew Talansky), but they will be disappointed to have let Froome put so much time into them. 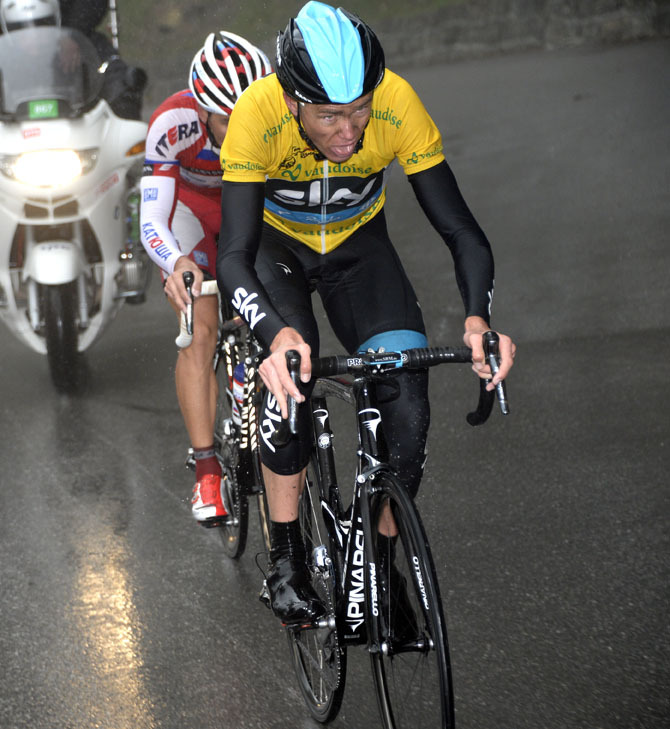 The group failed to work together as riders refused to work at the front, and by allowing a time-trialist as good as Froome so much time they have surely sacrificed any chance of winning overall. 2. Christopher Froome (GBr) Sky at st.
10. Igor Anton Hernandez (Spa) Euskaltel-Euskadi all at st.
6. Alejandro Valverde Belmonte (Spa) Movistar at st.
9. Carlos Alberto Betancur Gomez (Col) AG2R at st.